A total lunar eclipse is an opportunity for an astrophotographer to tell a story. The story can as simple as “the moon turned red last night” or something more engaging or educational. When planning to photograph an eclipse, I find that knowing the story I want to tell ahead of time can make choices of equipment, shots, and exposure settings clear. An image with a narrative is more engaging. As an amateur scientist, I find stories grounded in the physical reality of an event to be fascinating and educational. The challenge of revealing nature while transcending the limitations of equipment and circumstance is a great creative outlet. You may find your inspiration in myth or imagination. I find these images to be compelling as well. Don't leave your viewer in doubt when you create a composite fantasy. 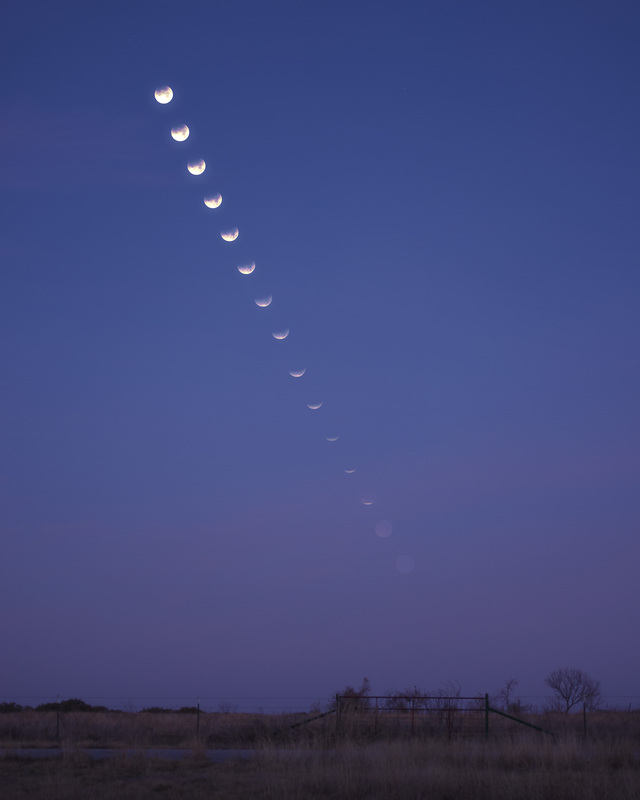 Beautiful timelapse images of an October eclipse, moving sideways along the horizon above a field of bluebonnets, can make a lovely composition. Expecting to see that in real life is heading for disappointment. The suggestions below are frames of reference grounded in the physical motions of the eclipse. I hope they inspire your own ideas for capturing the reality of the eclipse experience. The image below shows the key events in the interaction between the Moon and the Earth’s shadow. Astronomers often use a terminology for eclipses or transits of two bodies based on when the edges of each appear to touch or make contact as one passes by the other. These contact points are numbered 1 through 4 in time sequence. The Moon's shadow has two distinct concentric parts: the umbra or total shadow and the penumbra or partial shadow. Each of these has four possible contact times with an edge of the Moon. In time order these are designated: P1, P2, U1, U2, U3, U4, P3, and P4. The Moon moves in an eastwardly direction through the Earth’s shadow. The odd crescent of the moon that we see when the dark umbra partially covers the moon, just after U1 or before U4. The dramatic appearance or disappearance of the crescent of sunlight on the Moon right before or after totality, right before U2 or after U3. The deep orange and red colors of totality, between U2 and U3. The maximum total eclipse, midway between U2 and U3. Seen from the earth there are three sources of motion in the eclipse. These motions define natural frames of view for the eclipse, that emphasize different aspects of the event in our photography. Each view frame requires a different camera mount tracking and focal length lens. The Earth is about 4 times the diameter of the moon. The Earth's umbra gets smaller with distance because the Sun's rays are not parallel due to it's size and its light is diffracted by the edge of the Earth. 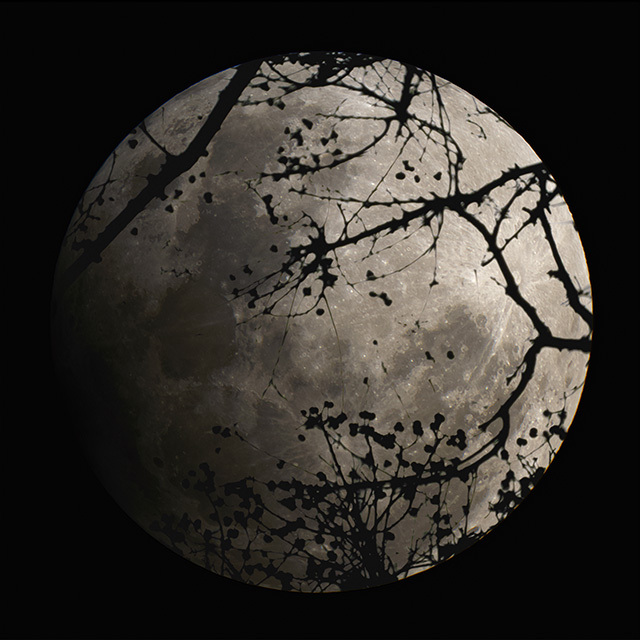 The Earth's umbra is only about 2.7 times the size of the size Moon at the Moon's distance. 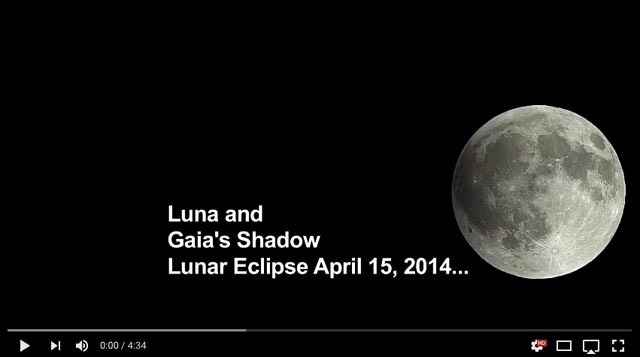 There are many possible ways to capture a lunar eclipse as a composite or video. These three frames of view are powerful because they give insight into the nature of the eclipse by being based on the physical motions of the actors in this drama. The fixed mount captures the human experience of the eclipsed moon moving across the sky. Tracking at the speed of the Sun let's us visualize the Earth's shadow in space as the Moon moves through it. Tracking the Moon gives us close up views of the earth's shadow with it's bands of color moving across the lunar surface. Arrangements of eclipse images into grids and circles or otherwise altering the motion of the moon have their uses, but it is at the price of leaving out part of the physical story of the eclipse. A camera on a fixed mount gives a frame of view dominated by the apparent motion caused by the Earth’s rotation. The Moon sweeps across a large part of the sky during the typical 3 and a half hour umbral (U1 to U4) eclipse. Capturing this requires a wide angle (short focal length lens). If our camera is on a tracking mount, we can cancel out the Earth’s rotation or the Moon's revolution and create frames of view that emphasize different aspects of the eclipse. If the camera tracks the Moon’s motion, then we can see in detail the progression of the Earth’s shadow across the face of the moon. Because the face of the moon is only 1/2 degree in size, we can use a very long focal length lens or telescope and show the moon in great detail. The stacked image below of the penumbral lunar eclipse of Feburary 11, 2017 was taken with a 1350mm Questar telescope tracking the moon through a tree. If we track the motion of the Earth’s shadow, this is the same speed as tracking the Sun, the source of this shadow, in the sky. Not all tracking mounts have a setting for this. However, the motion of the Earth’s shadow against the stars is very slow and using a sidereal (360 deg in 23 hrs 56 min) is very close to the correct speed. This frame of view holds the Earth’s shadow fixed in the frame and allows the Moon to move through the shadow during the eclipse. This will move the moon images in your frames closer by about Because the Earth’s umbra is about 2.6 times the size of the moon, the required field of view is about 2 degrees and an intermediate focal length can be used. If your mount tracked at a siderial rate rather than a solar rate your images in the final composite will be 7.3% too far apart along the direction of motion. You can adjust the image layer placements for this if you wish to visualize the shape Earth's shadow exactly. Foreground landscape and architectural elements can add context and local flavor to your story. Opportunities for these increase when you are using a shorter focal length and the moon is closer to the horizon during the eclipse. When totality is high in the sky, near the zenith, you can still include high elements such as buildings, trees, or mountains by carefully planning your location. 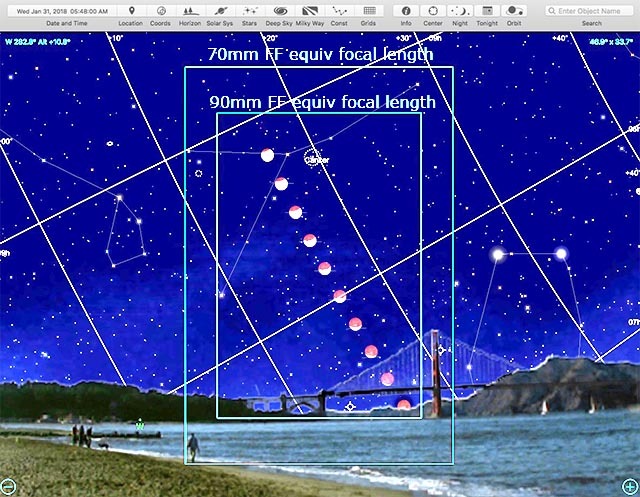 See these for examples of the planning process for an eclipse near the horizon and how focal length affects the appearance of the moon when shot with foreground elements. Screenshots from SkySafari were composited and edited for these visual framing plans. Once you have a visualization of where the moon will be in your frame and how high it will be above the horizon, you can look for landscape elements to incorporate into your shot. Your exposures will be set for the moon and may not capture your foreground well. Take some frames exposed for the foreground for your final composite. If you use one of the tracking frames of view you will need to pick the point in time that you want to show the foreground or it will be blurred in your final image. The brightness of the Moon varies tremendously during the course of the eclipse. 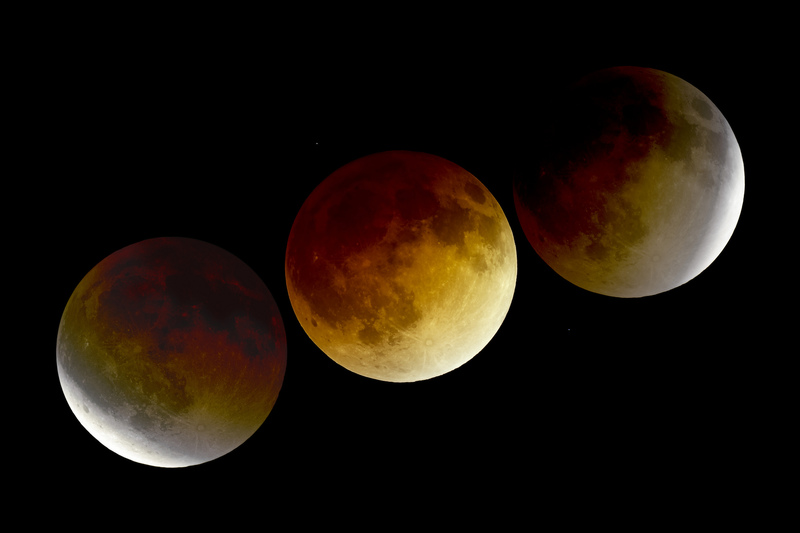 Exposure can vary 18 stops or more (250,000 times) from the uneclipsed full moon to the darkest total eclipse. 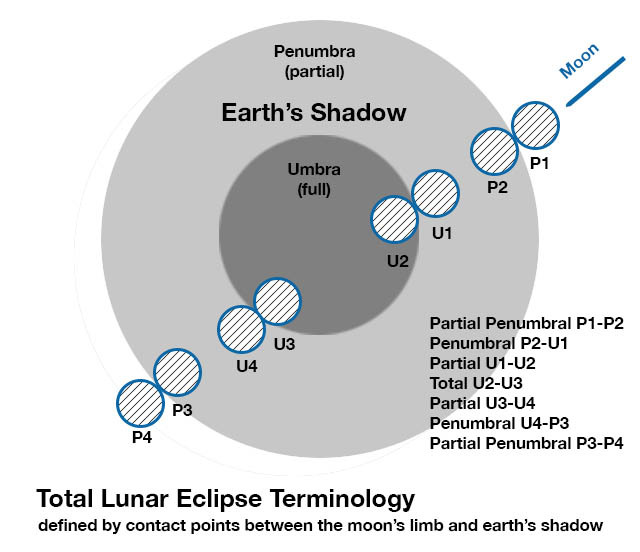 The brightness of the Moon varies greatly from eclipse to eclipse, as much as 5 stops during the penumbral phases and 8 stops at maximum totality. The Moon's path through the umbra can pass near the edge or through its darkest center. The light that reaches the moon during the eclipse is scattered by the earth's atmosphere and this depends strongly on the weather conditions around the edge of the earth. Exposure varies very rapidly at times near the U2 and U3 contacts. The dynamic range of exposure during partial umbral eclipse (U1 to U2 and U3 to U4) needed to capture both the partially lit crescent and the umbra darkened face can be as much as 8 or 10 stops. Images that capture what your eye sees at these times require multiple exposure high dynamic range techniques. The Danjon scale is used to rate the darkness of a total lunar eclipse. It ranges from an L value of 0 where the moon is almost invisible at greatest eclipse to 4 which is a very bright orange. It is a subjective scale. Fred Espenak's guide suggests two stops (4 x) of exposure difference between each step of the scale. Turn off all automatic features on your camera. Auto focus, auto exposure, and image stabilization will all work poorly or not at all. Shoot RAW images to capture the most dynamic range and allow for exposure correction in post processing. Turn on electronic first curtain shutter to minimize vibration. If you use a DSLR, mirror lock up should be used to reduce vibration. Do not expose to the right on your histogram. Exposure aids are easily fooled in astrophotography and there is no recovery from over exposure. Crop factors are about 1.5 for APS sensor sized DSLRs and 2 for micro 4/3 cameras. This will give the longest exposure time that you should use during the darkest part of the eclipse with your camera and lens. Look up the base ISO speed at which your camera gets the greatest signal to noise ration (dynamic range). You want to shoot as close to this speed as possible. Find out if your camera is ISO invariant. A general rule of thumb is that Canon is not, but Sony and Nikon are. Increasing your ISO beyond this base speed, will only decrease your camera's dynamic range in an ISO invariant camera. If your image is too dark at the base ISO you can simply increase the exposure of your RAW images in post production. This will give you the correct exposure without loosing valuable dynamic range. If your camera is not ISO invariant, modest additional gain while shooting dark images will help. If you need to check your focus when the image is too dark, you can temporarily boost the ISO while focusing. I find it very helpful to take advantage of multiple exposures when shooting an eclipse. Multiple exposures can be used in post processing to reduce noise and seeing distortions by lucky image staking and to increase dynamic range by HDR techniques. Many new cameras have shutter modes that make shooting image bursts much easier. If your camera has these, they can be a great help. Burst of 5 or 10 images allow stacking to reducing noise by 2 to 3 times in your final images. HDR exposure sweep modes during the shots near U2 and U3 can be exposure stacked for high dynamic range images. 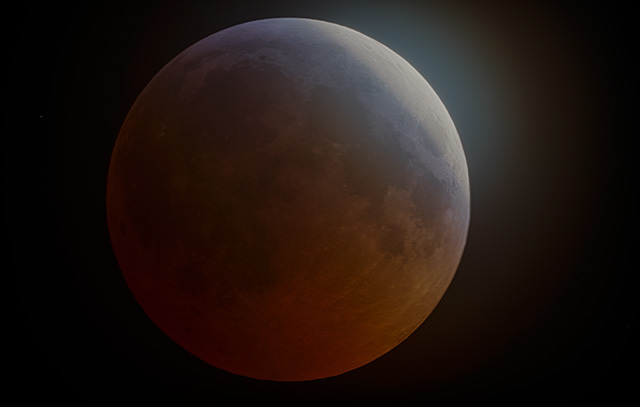 You can fully automate your eclipse photography with a tethered imaging application like Xavier Jubier's Lunar Eclipse Maestro, if you have a supported camera and computer. Otherwise use a simple plan with your anticipated exposure and shutter mode changes at the key points in the eclipse. 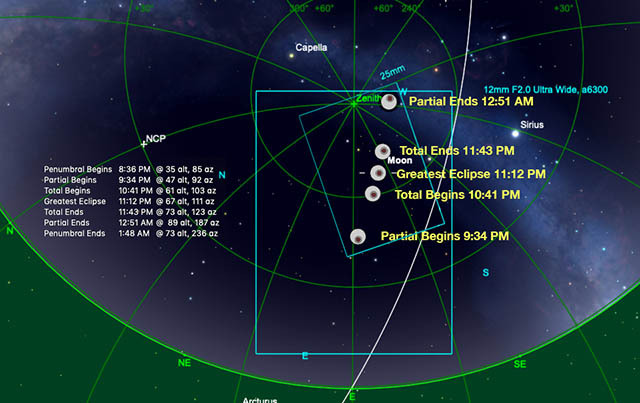 You can get the timing of the key events at Fred Espenak's Eclipsewise or NASA's Lunar Eclipse Page. Rather than keeping track of a just a jumble of aperture and speed settings, I prefer to record the anticpated changes in exposure values. As the eclipse proceeds, I will check the exposure of selected images to adjust for actual conditions. If my plan is in specific settings, the subsequent settings will be wrong. If I plan these as exposure value changes then subsequent planned exposure adjustments are still correct. Here is a sample plan for the lunar eclipse of January 20-21, 2019 for a 185mm lens on a Sony NEX-5N camera. Times are from Eclipsewise and SkySafari. Calsky estimates the darkness at peak eclipse at Danjon 2.8. 9:57 30% obscured partial +1 EV f/4 1/500 @100 "
10:24 80% obscured partial +1 EV f/4 1/125 @100 "
10:28 90% obscured partial +1 EV f/4 1/60 @100 "
10:36 95% obscured partial +1 EV f/4 1/30 @100 "
10:41 U2 starting totality +2 EV f/2.8 1/30 @200 "
11:42 U3-- late totality -3 EV f/2.8 1/8 @200 "
11:43 U3 ending totality -2 f/2.8 1/15 @100 "
11:50 95% obscured partial -2 EV f/4 1/30 @100 "
11:55 90% obscured partial -1 EV f/4 1/60 @100 "
12:15 50% obscured partial -1 EV f/4 1/250 @100 "
12:24 30% obscured partial -1 EV f/4 1/500 @100 "
12:52 Penumbral -1 EV f/4 1/1000 @100 "
1:52 No Eclipse -1 EV f/5.6 1/100 @100 "
Here is a more complex plan for the lunar eclipse of January 20-21, 2019 for my f/15 Questar telescope. It takes advantage of HDR burst modes on the camera to capture a 9 stop range of exposure during the rapidly changing conditions at the beginning and end of totality. Maximum exposure in the bursts is limited to 30". Exposure will be corrected in stacked images in post processing. The large shifts in exposure times at those times are because of the 4 stop offset in the minimum or maximum exposure when switching to and from the 9 exposure HDR mode in my Sony a6300 camera. 9:57 30% obscured +1 EV 1/30 @100 "
10:28 90% obscured +1 EV 2 @200 +/-4EV "
10:36 95% obscured +1 EV 2 @400 +/-4EV "
10:41 U2 +2 2 @1600 +/-4EV "
10:44 U2++ NC +2 EV 2 @1600 +/-4EV "
11:43 U3 -2 1/2 @1600 +/-4EV "
11:50 95% obscured -1 EV 2 @200 +/-4EV "
11:55 90% obscured -1 EV 2 @100 +/-4EV "
12:15 50% obscured -1 EV 1/30 @100 "
12:24 30% obscured -1 EV 1/60 @100 "
12:52 Penumbral -1 EV 1/120 @100 "
1:52 No Eclipse NC -1 EV 1/110 @100 "
I've left equipment last deliberately. Almost any camera is capable of capturing good images of a lunar eclipse. The wide field of view time lapse fixed tripod image above was made with a point and shoot camera with a zoom lens. If you don't have a removable or zoom lens with a long reach you may be limited in your choice of frame of view. A camera with a high quality lens, good low light performance, and an interchangeable or zoom lens is a plus. A telescope will give higher quality close up images. An intervalometer camera application or hardware is a good way to get uniformly spaced time lapse images. I plan an interval of several minutes between images. This also allows plenty of time to make exposure changes and check them between shots. You can trigger extra exposures as needed, at critical times.